Compact Structured Backpack Style Kit Bag. DIMENSIONS: 75cm tall x 35cm deep x 35cm wide - the smallest duffle bag in the Salix range. Ideal for training or junior cricket. Full Length, Cushioned Twin Shoulder Straps - for comfortable rucksack carrying and easy transit. Deep Top Loading Zipped Main Compartment. Twin Zipped Side (Batting Pad) Pockets. Deep Front Wet/Boot Zipped Pocket. Strong Heavy Gauge Woven Fabric construction. Ink Blue Colour, with stone stitch-print, chrome embroidery and textured black contoured side panels. The Salix Pod Pack Junior Duffle Bag is the smallest duffle bag in the Salix range, making it ideal for training or junior cricket. 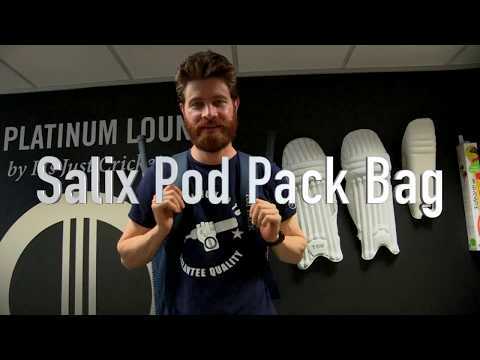 Despite its size, the compact Salix Pod Pack Junior Duffle Bag is still highly organised, with a deep main compartment, twin outer bat pockets, twin side batting pad pockets, a front boot pocket and even a valuables pocket. The full length, cushioned twin shoulder straps allow comfortable rucksack carrying and easy transit.